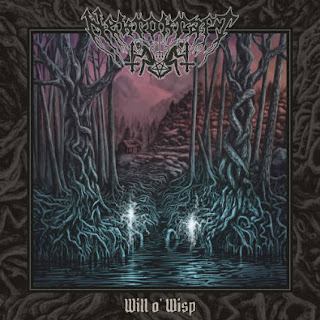 Nekrokraft are a band from Sweden that plays a raw and melodic mixture of black, death and thrash metal and this is a review of their 2017 album "Will o' Wisp" which will be released in July by The Sign Records. Blast beats along with some fast yet raw riffing that utilizes a great amount of tremolo picking starts off the album along with some grim black metal screams and thrash elements a few seconds later and when guitar solos and leads are utilized they are done in a very melodic fashion. You can also hear all of the musical instruments that are present on this recording and when acoustic guitars are utilized they add in a touch of folk music and when melodic vocals are utilized briefly on one of the later tracks they give the music a more ritualistic feeling and they also make an old school style sound more modern. Nekrokraft plays a musical style that takes a raw and melodic form of black metal and mixes it with thrash and death metal to create a sound of their own, the production sounds very professional while the lyrics cover Occultism and Folklore themes. In my opinion Nekrokraft are a very great sounding raw and melodic mixture of black, death and thrash metal and if you are a fan of those musical genres, you should check out this band. RECOMMEDNED TRACKS INCLUDE "Ov Hell" "Hellfire" and "Succubus". 8 out of 10.